Posted by Theresa June 21, 2016 10 a.m.
Who could ask for better weather for 2016 Summer Parkways? 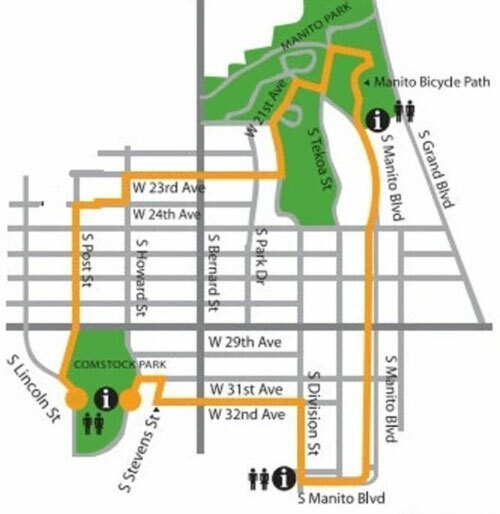 The annual community event, which takes place between Manito and Comstock parks, is tonight, Tuesday, June 21, from 6 to 9 p.m., and the forecast shows mostly sunny skies and temps in the mid-70s. Participants are able to enjoy four miles of car-free streets for running, walking, cycling or skating, as well as other family-friendly activities like fitness activities, chalk art, music and dancing, jump rope, food vendors and much more. And there’s something new for this year’s festivities. Pick up a “Parkways Passport” at Manito Park (Manito Place and Manito Blvd. ), Jefferson Elementary (Division St. and Manito Blvd.) or Comstock Park (Post St. and 32nd Ave.). Collect stamps at booth along the route and turn in a completed Passport at the final spot to enter a raffle for the Grand Prize, a 2016 SpokeFest registration for a family of four. There will also be a raffle giveaway of 10 Strider Bikes, courtesy of SpokeFest. Kids ages 18 months to 5 years can test out the bikes at the Strider Adventure Zone course (S. Manito Blvd. and S. Division St.) from 6 to7:15 p.m.
Don’t miss out on the sunny skies and outdoor fun! Visit Spokane Summer Parkways more information.